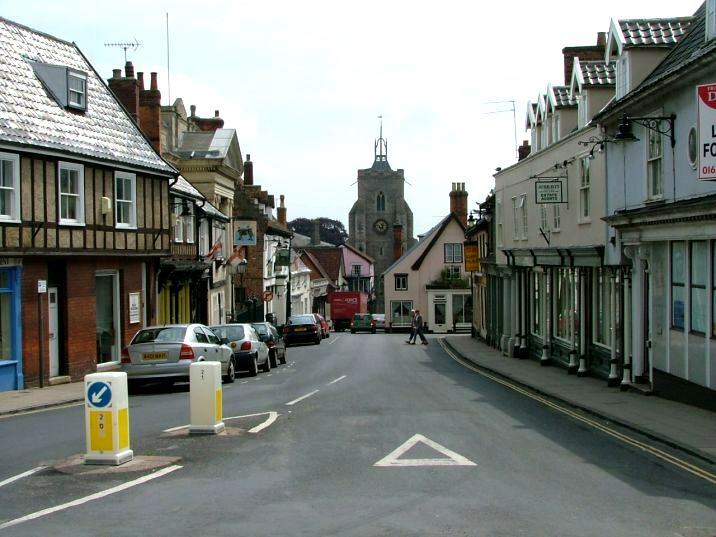 Diss is one of the most interesting of all Norfolk towns, and about as typical of the county as you can get. 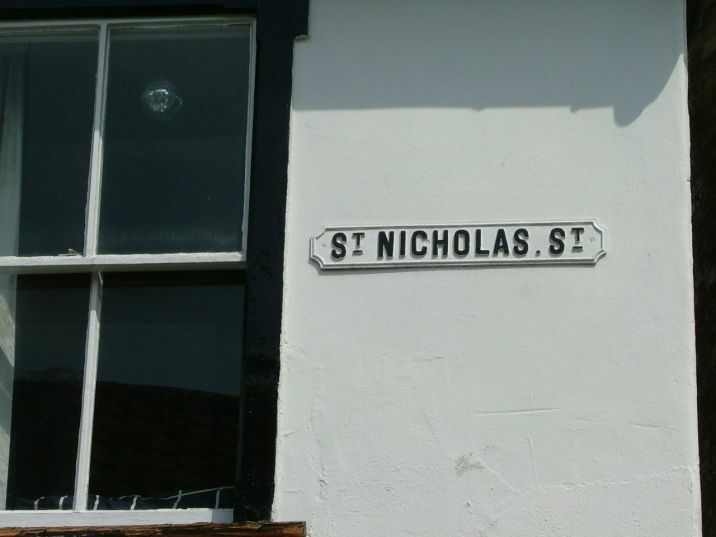 It is home to the mighty St Mary, but the road that runs away from the church to the west is called St Nicholas Street, and it might give cause to wonder if the modern dedication of the town church is inaccurate. In fact, there were once two churches. The northern line of the street was once the northern edge of the market place, but in the 13th century a group of buildings was built on the slope of Market Hill, creating two new streets. It was to the north of the northernmost of the two that, in the 15th century, the chapel of St Nicholas was built. Pevsner places this on the south side, but I do not think that can be right; this side falls away quickly, and the little shops and houses barely cling on to it. And there are other reasons for placing it on the north side, as we shall see. St Nicholas was built in the 15th century at a time when one of the main functions of the Catholic Church was preparing for death. There was a great multiplicity of guilds at this time, usually representing particular trades. They acted a bit like friendly societies - you paid a penny or so a week, benefited from the guild's hospitality, and knew your soul would be prayed for after you died. Diss does not seem to have a single large benefactor, and the modest expansion of St Mary in the 15th century is almost certainly a result of the activities of guilds. But St Mary still wasn't big enough; hence, the building of St Nicholas. It lasted barely a century; the Reformation put an end to prayers for the dead, and the need for chapels like this one. Diss is remarkable for its considerable amount of surviving Tudor buildings, and there are few Georgian replacements; the economy did not revive from the doldrums here until the railways arrived in the 19th century. 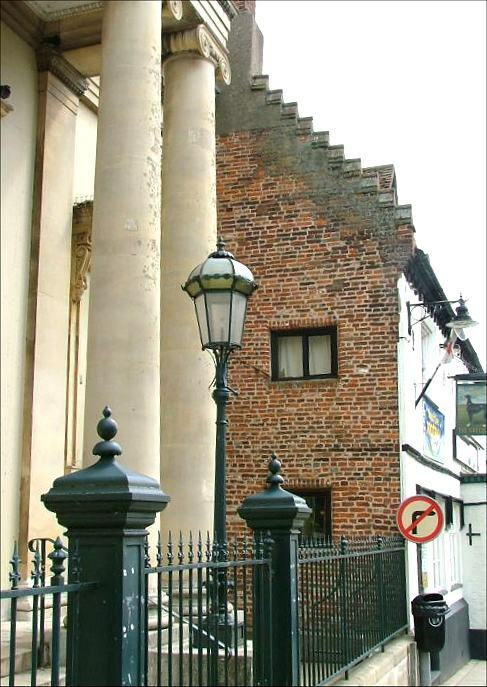 One product of this renewal stands at the top of Market Hill on St Nicholas Street; this is the 1854 Corn Hall, a grand Doric facade that Pevsner describes as remarkably civilised. Directly opposite is a truncated late 15th century building, now a clothes shop. It was once much bigger, with facades facing east and north. 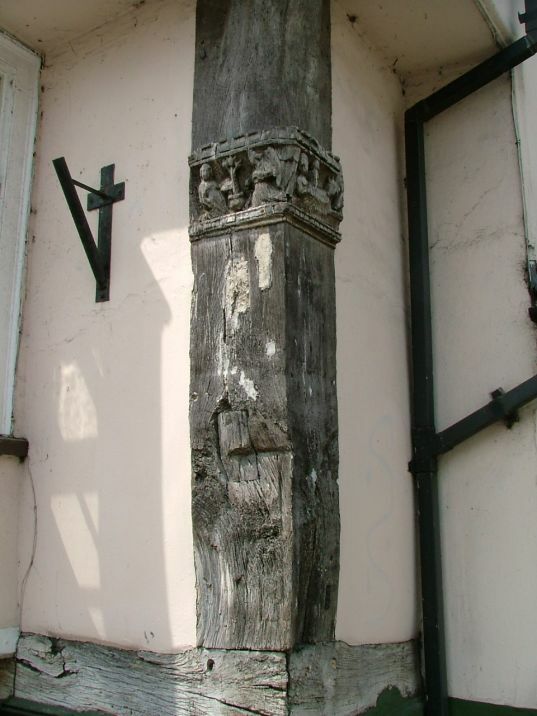 Just one of the medieval corner posts survives, and it is a remarkable survival. 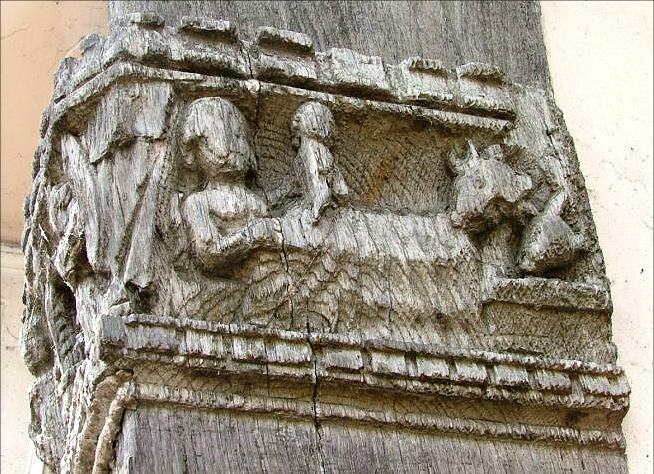 It has two reliefs carved in it, both clearly decipherable despite half a millennium of soft Norfolk rain: one shows the Annunciation to the Blessed Virgin, the other the Nativity of Our Lord. They are both quite undamaged, and obviously form what was the start of a rosary sequence of the Joyful Mysteries of the Blessed Virgin. 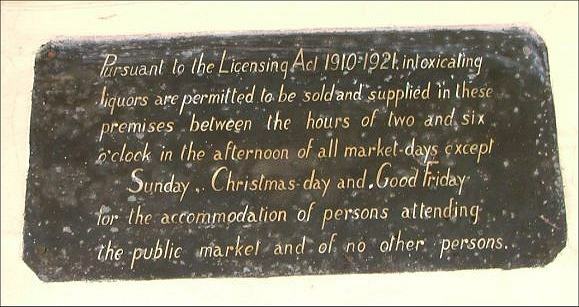 Almost certainly, this building was the guild hall to the lost church of St Nicholas. But it is the building imediately to the east of the Corn Hall that really caught my attention. 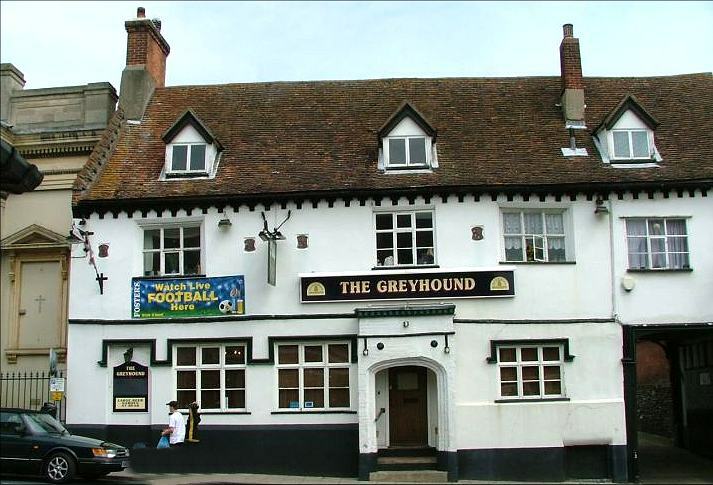 This is the Greyhound public house, dated by Pevsner about 1580. It is of interest for two reasons. 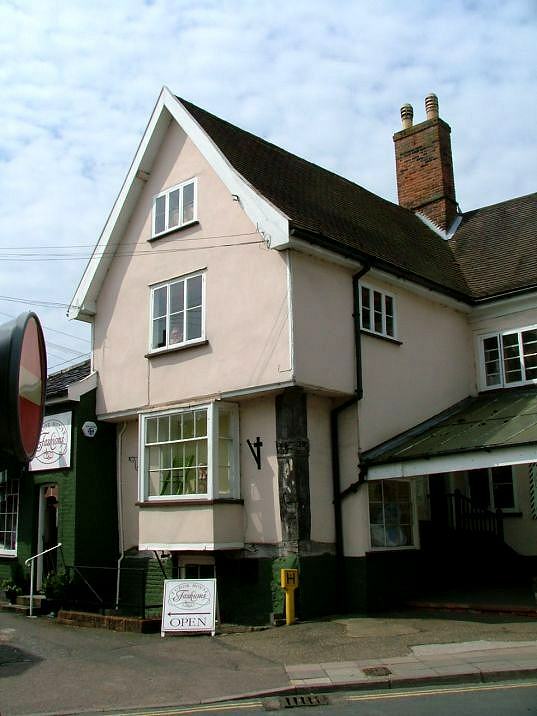 Firstly, it has a massive brick-built stepped Tudor gable at its west end. There is no such thing at the east end - indeed, the east end appears almost as ancient, but built of framed and plastered wattle and daub. Almost certainly, the western gable has been reused from an earlier building. It reminded me very much of the stepped 15th century gables on the church at Woodbastwick. 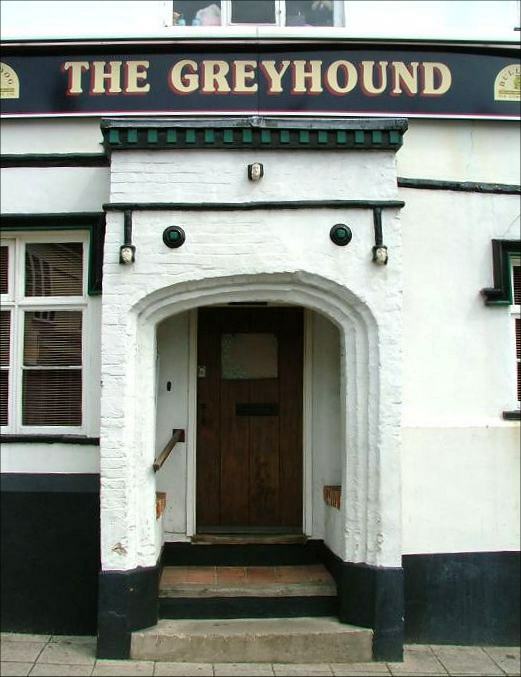 On the south front of the pub, there is a most unusual porch. Brick-built (although painted over) it has a low Tudor arched entrance, with three painted headstops set above it - they look like reused window headstops. Inside the porch, under modern brick linings, there are low seats. Pevsner spotted the porch - he missed the gable - but for me the feature of interest is something that is missing - the gable at the other end. It seemed to me that there were several reasons for this not to be there, and one was that the western gable had been reused from a building that never had a substantial gable at the eastern end - most obviously, a church. On a towerless church, the western gable would be pretty much complete, but the large eastern windows fashionable in the 15th century would have made the eastern wall useless for a new building. 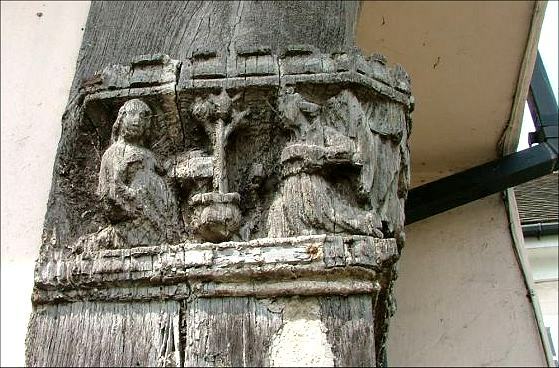 And the porch - it is obviously rebuilt, and may not even be in its original place, but you do not need to be an ecclesiological archeologist to divine some kind of church use. I can't be absolutely certain, but the evidence is compelling, and I think that the porch and the gable end are the last reminders of the lost 15th century chapel of St Nicholas.